The two fact sheets mention the insect's role in the transmission of blue-stain fungi. Dead and dying pine trees, recently felled pines and pines subjected to stresses such as poor soil conditions, glaze ice and storms should be removed as quickly as possible to eliminate potential egg-laying sites for the common pine shoot beetle. All this material should be disposed of before beetle emergence, and any harvested logs should be processed before the beetles emerge in spring, so that dispersal into areas free of the beetle is not promoted (ISSG [N.D.]). Chlorpyrifos and cyfluthrin can reduce beetle emergence (ISSG [N.D.]). Several other insecticides are used in the United States, such as bifenthrin, esfenvalerate, lamdacyhalothrin and carbaryl, but they may not be available on the Canadian market (ISSG [N.D.]). Certain synthetic chemical repellents can be applied to make pines unappealing to the beetles; these repellents could be used on high-value trees. A blend of 1-hexanol, (Z)-3-hexen-1-ol, (E)-2-hexen-1-ol, 3-octanol and verbenone is reported to act as a repellent, or disruptant, for the common pine shoot beetle (Poland et al. 2004).Insecticides registered in Canada for use against wood boring insects of ornamental trees and for Christmas tree plantations generally contain permethrin. 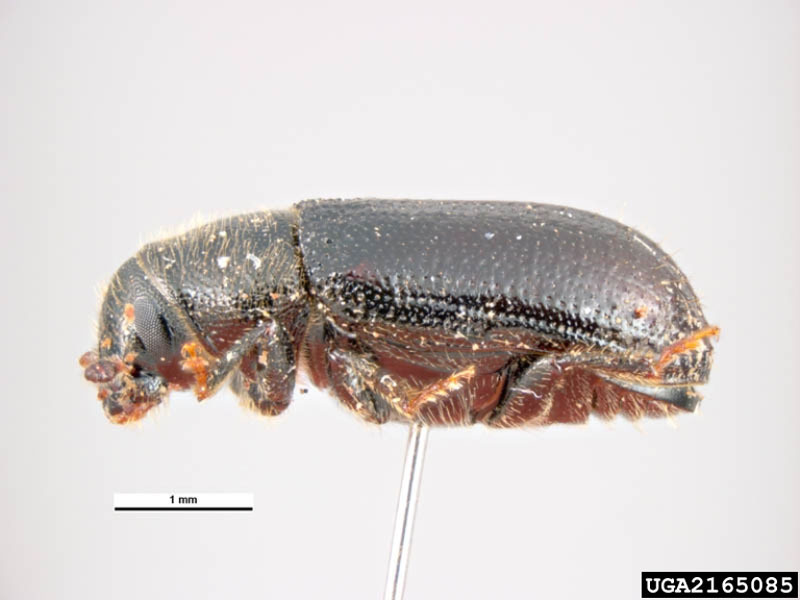 In the United States until 1996, the Coleoptera Thanasimus formicarius (L.) was considered a potential candidate for biological control of the common pine shoot beetle. However, the release of this predatory beetle was postponed indefinitely because the level of damage to the pine resource caused by the pine shoot beetle was not significant and because of concern over the potential effects on certain native insect species (ISSG [N.D.]). Shortleaf pine (Pinus echinata P. Mill.) and slash (Pinus elliottii Engelm.) have shown resistance to the PSB (ISSG [N.D.]). 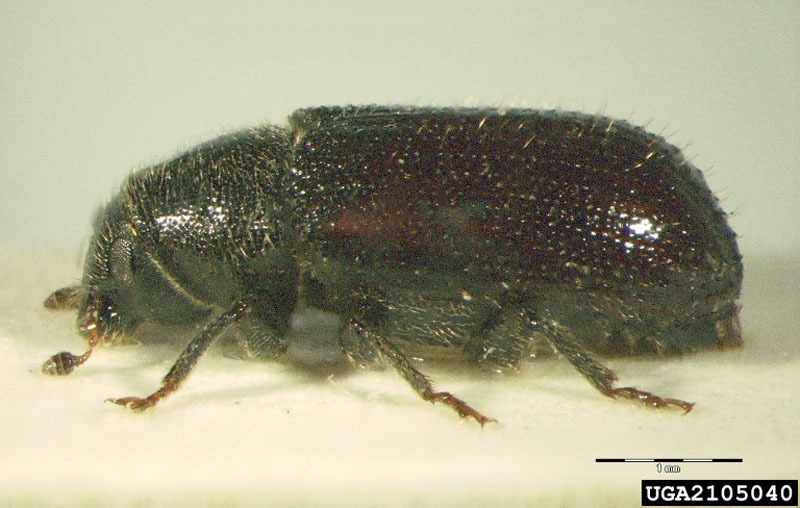 In southern Ontario and in Quebec, the common pine shoot beetle Tomicus piniperda is a secondary pest that successfully colonizes only stressed trees (Morgan et al. 2004; Pierre Therrien, MRNF, personal communication). However, this insect is associated with various blue-stain fungi in the United States (Jacobs et al. 2004) and in Ontario (Hausner et al. 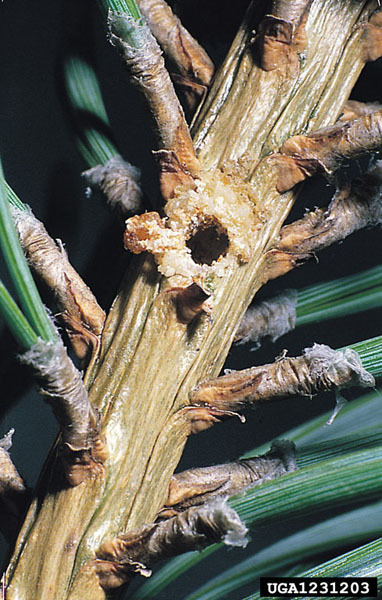 2005), including Leptographium wingfieldii, an exotic pathogen that kills trees. In France, in the Orléans forest, only about 5% of common pine shoot beetles have been found to carry this blue-stain fungus (Lieutier et al. 2004). According to the ISSG [N.D.], there is no need to be worried about this association. We do not know the corresponding rate of infestation in Canada. Nonetheless, caution is required owing to the risk of dispersal of the common pine shoot beetle into Canada's extensive tracts of natural jack pine forest. This also explains why the pest is listed in the Canadian Food Inspection Agency's plant phytosanitairy directives. Integrated pest management measures are implemented in Christmas tree (Scots pine) plantations. With this approach, the extent of shoot feeding by the beetles is reduced to about 0% to 4%, whereas they could reach 28% to 67% in the absence of integrated pest management measures (ISSG [N.D.]). • In the spring, common pine shoot beetle eggs and larvae can be seen under the bark of logs, stumps and stressed trees. 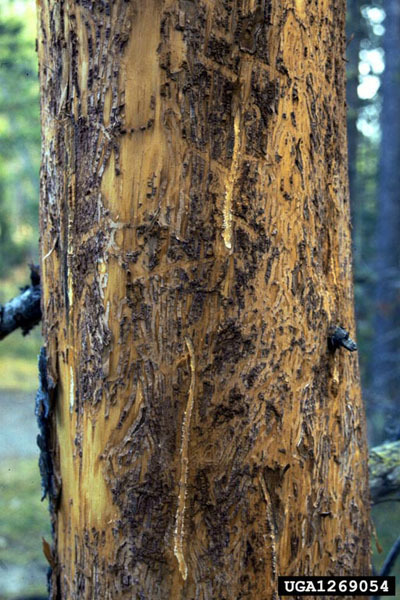 The damage caused by this exotic species can be observed before the damage caused by native bark beetle species. Look for hollowed-out wilted yellow or reddish shoots that have fallen on the ground, for entrance or exit holes and for galleries (with frass) in boles (Humphreys and Allen 1999). • Remove stressed or dying trees, taking care to cut stems as close to the ground as possible. • Trap logs can be scattered on the ground in stacks in February or March, using about 5 logs (preferably Scots pine) per hectare of plantation; the logs should gradually be replaced every month (Abgrall and Soutrenon 1991). The trap logs should be inspected every two weeks beginning when the daytime temperature reaches about 10°C. Between May 1 and 20, destroy all logs that have been colonized by common pine shoot beetles (Humphreys and Allen 1999) by burning, burying or chipping. • Lindgren® funnel traps baited with alpha-pinene can be used to detect the presence of common pine shoot beetles. According to the ISSG ([N.D.]) and Poland et al. (2004), trans-verbenol can be added to increase trap efficacy. The funnel traps and the trap logs must be placed a considerable distance away from any pine trees that represent potential hosts for the insect (Humphreys and Allen 1999). These attractants cannot be used for the suppression of common pine shoot beetle populations. • Application of a registered pesticide on the foliage and the trunk can help to protect against attacks. Spraying must be done just before the new adults emerge from the host material to keep them from infesting new pine shoots. Although the best timing for spraying depends on the microclimate at the site, early May is generally a good time. If feeding puncture wounds are observed on new stems, it may be advisable to spray a registered pesticide on the trunk (Humphreys and Allen 1999). • Application of a registered pesticide on the exposed surface of stumps just before adult flight begins, that is, in February or March, followed by another treatment just before the flight period of the new adults in April or May, can bring about a considerable reduction in emergence (Humphreys and Allen 1999). Abgrall, J.F. et Soutrenon. A. 1991. La forêt et ses ennemis, 3ième édition. CEMAGREF Grenoble. p. 99-102. Hausner, G.; Iranpour, M.; Kim, J.-J. ; Breuil, C.; Davis, C.N. ; Gibb, E.A. ; Reid, J.; Loewen, P.C. ; Hopkin, A.A. 2005. Fungi vectored by the introduced bark beetle Tomicus piniperda in Ontario, Canada, and comments on the taxonomy of Leptographium lundbergii, Leptographium terebrantis, Leptographium truncatum, and Leptographium wingfieldii. Can. J. Bot. 83: 1222-1237. Humphreys, N. et Allen, E.A. 1999. Le grand hylésine des pins. Ressources naturelles Canada, Service canadien des forêts, Centre de foresterie du Pacifique, Victoria, C-B. Avis Concernant un Ravageur Forestier Exotique 2, 4 pp. Invasive Species Specialist Group (ISSG). [N.D.]. Management Information for Tomicus piniperda (common pine shoot beetle) http://www.issg.org/database/species/management_info.asp?si=1200&fr=1&sts=sss&lang=EN consulté le 23 février 2009. Morgan, R.E. ; De Groot, P. and Smith, S.M. 2004. Susceptibility of pine plantations to attack by the pine shoot beetle (Tomicus piniperda) in southern Ontario. Can. J. For. Res. 34: 2528-2540. Poland, T.M. ; De Groot, P.; Burke, S.; Wakarchuk, D.; Haack, R.A. and Nott, R. 2004. 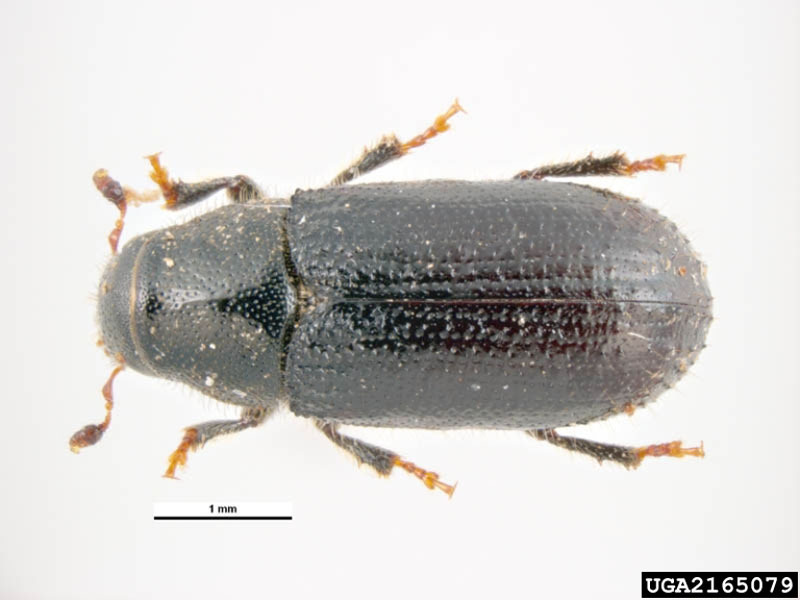 Semiochemical disruption of the pine shoot beetle, Tomicus piniperda (Coleoptera: Scolytidae). Environm. Entomol. 33: 221-226.